from 3 pcs. 15,70 EUR ea. from 10 pcs. 14,15 EUR ea. from 20 pcs. 13,40 EUR ea. from 40 pcs. 12,73 EUR ea. Is counting sheep in bed not your thing? We find hanging up photos much more exciting as well! The cute sheep on this photo rope hold your favourite photos in the desired position. 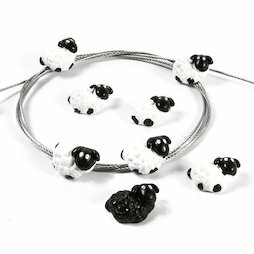 A set contains eight sheep magnets as well as a 1,5 m long steel rope with a weight. If you want to expand your flock or farm, you can find other animals further down the page under product suggestions. 1 pc. 33,14 EUR ea. 1 pc. 5,53 EUR ea.